Apple cider vinegar was almost certainly found by accident as fermenting sweet sugary apples can of course result in cider but often goes a different route depending on the yeast present and result in apple cider vinegar. As well as being used in cooking and other uses in the household such as cleaning it has been found to be a remedy for weight loss, reducing blood sugar and combatting the symptoms of diabetes. Apple cider vinegar has even been shown to be effective in clearing warts and verrucae. These claims have a scientific basis and we will look at its uses below. As its name implies apple cider vinegar started off on the road to cider, however, instead of the yeast turning the apple’s sugars to alcohol, a different yeast turned the sugars into acetic acid so making cider vinegar. When cider vinegar is formed the original sugar solution is cloudy as it contains the harmless products of fermentation and friendly bacteria. 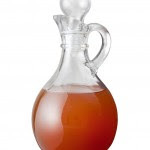 This cloudy vinegar is known as the “mother” it is thought that the murky cloudiness is the source of it health benefits though as yet there is no clinical proof. Whether the acetic acid itself or its cloudy nature imbues the biological effects is unclear, it is low in calories and contains few vitamins or minerals, though it does contain a small amount of potassium, some amino acids and antioxidants. Perhaps it is vinegar’s acidity that helps kill bacteria and fungal pathogens, Vinegar has long been used for both cleaning and disinfecting. It can be used to clear up nail fungus, lice and warts and is effective against ear infections as well. The uses of vinegar as a food preservative go back a really long way since the acidity prevents bacteria from growing on the food, The same antiseptic qualities may also have something to do with the fact that diluted apple cider vinegar when applied to the skin can help when treating acne. It has been shown that Apple cider vinegar actually improves the sensitivity of the hormone insulin effectively turning it on. In this way it can lower blood sugar, which may be higher after meal times. Apple cider vinegar has shown great promise in improving insulin sensitivity and helping to lower blood sugar responses after meals. This is of great help for suffers of type 2 diabetes where the patient cant produce insulin or the body is resistant to insulin. Improves insulin sensitivity during a meal by 19-34% and so lowers blood glucose. Blood sugar levels fall by 34% following the consumption of 50 grams of white bread. 2 tablespoons of apple cider vinegar before bedtime reduces fasting blood sugars by 4%. Having just discussed how apple cider vinegar can affect blood sugar levels it is hardly surprising to hear that it can affect our body weight. Vinegar increases the feeling of satiety, obviously if it makes an individual feel full the overall consumption of calories will fall. Vinegar consumption when eating a high carbohydrate meal can lead to a reduction of 200-275 calories, which over time can obviously aid weight loss. Heart disease and strokes fall into the category of cardiovascular disease which is currently one of the worlds largest causes of death. As we are no not all cholesterol is bad,in fact LDL-cholesterol loss can increase heart disease Apple cider vinegar contains chlorogenic acid and it is anti-oxidant which is an important. It protects the LDL cholesterol so protecting the heart from cardiovascular disease. The important part consider from this headline is the word “may” There have been some studies that have shown that vinegar can kill cancer cells and shrink tumours. Practical Use of Apple Cider Vinegar. Apple cider vinegar is also said to boost energy levels and have other beneficial health affects. There is enough speculation to warrant trying this out for yourself as it seems the beneficial effects can be stronger in some people and less effective in others. The good thing about this is that apple cider vinegar is easily incorporated into your diet as it is such a good cooking ingredient. It appears in salad dressings and mayonnaise and can be diluted with water and taken as a drink. Outside of the body apple cider vinegar is good for the skin. It can be used as a mouthwash and also acts as a hair conditioner. Bragg's is a popular brand of apple cider vinegar the Biona and Raw health are also on offer.